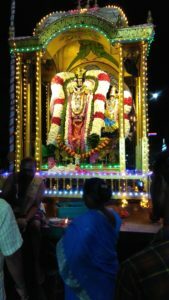 On the occasion of Pournami (March 20), Lord Velleswarar and Kamakshi ambal were taken out in a colourfully lit palanquin around the Mada streets at around 8 p.m. The gods were adorned with beautiful garlands and jewellary. The procession was taking place even as many devotees were gathering at Sri Kapali Temple for getting darshan of Thirukalyanam. This entry was posted on Wednesday, March 20th, 2019 and is filed under Religious. You can follow any responses to this entry through the RSS 2.0 feed. You can skip to the end and leave a response. Pinging is currently not allowed.